Got a second Echohead because they were on clearance at Musician’s Friend. I’m not really sure how to use two delays yet, but I couldn’t pass up the deal. I then altered my tap tempo box to have tap tempo switches for both pedals. While I was at it I did a little bit of nicer artwork on my looper and the tap tempo box: permanent marker covered in scotch tape! This meant my Looper is not off the board, which is fine, because I’m OK carrying it along when I know I’m doing looping, otherwise there’s not really a reason to have it on the board. 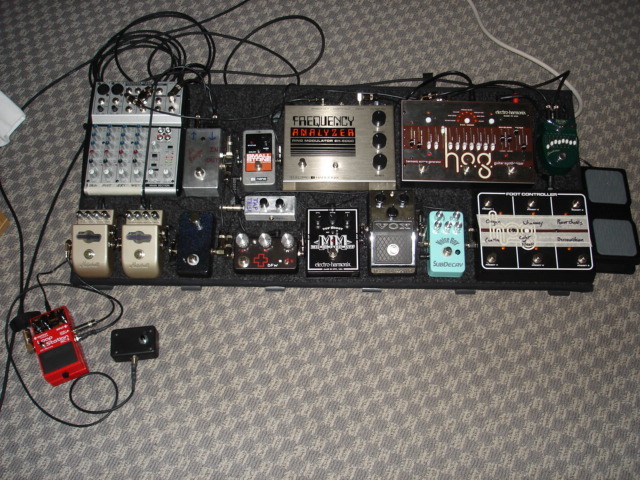 Someday I’ll have an EHX 2880 anyway, which will have a dedicated board with it’s foot controller. Anywho, I started work on a DIY noisegate. I have the enclosure there just filling in space while I wait on the PCB components. I etched my own PCB for it, and will post a little step by step pictorial about that whole process when we get that far.